Share the post "Rutgers Bee-ginner’s Beekeeping Course Gives Many New Jersey Apiarists Their Start"
Acting Governor Kim Guadagno was joined, from left, by Robert M. Goodman, Executive Dean of Agriculture and Natural Resources at Rutgers; Marilou Halverson, New Jersey Restaurant Association; Janet Katz, President of the NJ Beekeepers Association; Lina Llona, Middlesex County Chamber of Commerce; Lt. Gov. Kim Guadagno; Douglas H. Fisher, NJ Secretary of Agriculture; Ryck Suydam, New Jersey Farm Bureau and NJ Senator Steven V. Oroho (R-Morris, Sussex, Warren). On July 31, in a bill signing ceremony at the Rutgers Gardens Farmers Market in New Brunswick, Acting Governor Kim Guadagno signed three pieces of legislation passed unanimously by New Jersey lawmakers in support of beekeepers in the Garden State. 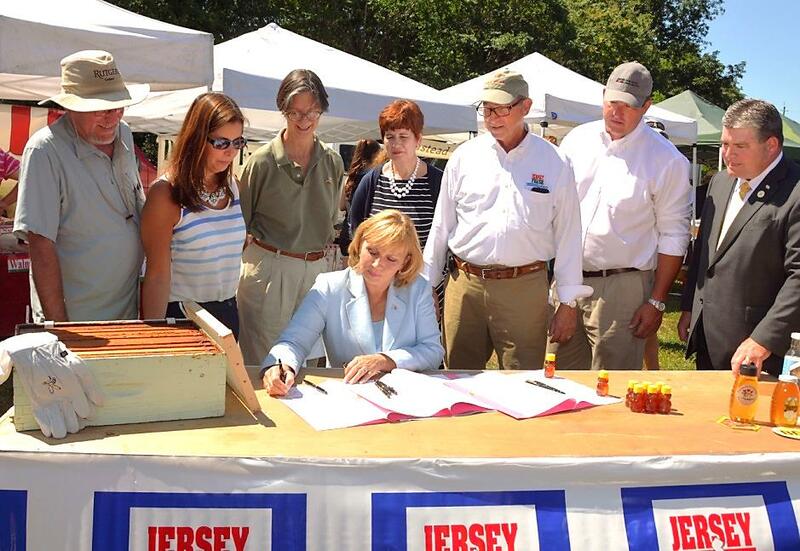 “These bills collectively provide appropriate protection to New Jersey’s growing beekeeping industry, support the Garden State’s commercial and recreational bee industry, and heighten public awareness of the importance of bees to our food chain,” said Guadagno. New Jersey has more than 3,000 registered beekeepers who tend colonies of honey bees, the official state insect, and other bee species like mason and bumble bees that are critical to crop pollination. Many of these beekeepers, from all walks of life, got their start with Rutgers Bee-ginner’s Beekeeping course, offered by the Office of Continuing Professional Education at the New Jersey Agricultural Experiment Station. “Initially I just wanted to have a greener yard, a greener lifestyle,” said Seth Belson, a Cherry Hill resident and attorney with the New Jersey Office of the Public Defender. 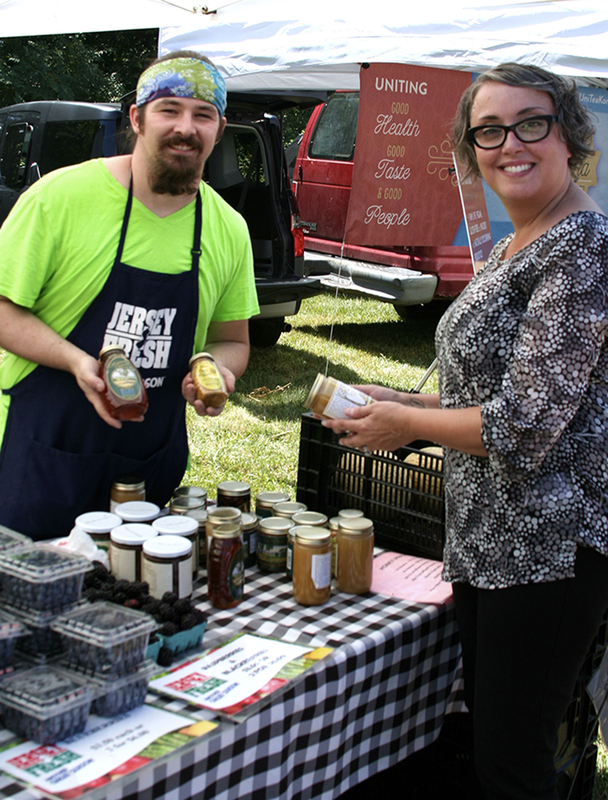 Dalynn Knigge, who administers OCPE’s Bee-ginner’s Beekeeping course, and Nick Kallatch display locally harvested honey sold by Fruitwood Orchards, a weekly vendor at the Rutgers Gardens Farmers Market. Michael Long’s motivation was finding a solution to the misshapen fruit on his Little Egg Harbor property. Kim Bugemelian of Long Valley wanted to reconnect with a childhood interest and help her organic garden grow to its full potential. And Pam Wardle, a resident of Bordentown City, wanted a hobby that would force her to relax and relieve the stress and pressures of her job as in international business development for Church & Dwight. Despite their different goals, these beekeepers all found their way to the same program at Rutgers, and as they learned, beekeeping can be infectious. “As you get into beekeeping, there are more and more aspects that fascinate you,” said Belson. They are among the more than 2,500 persons who have taken the two and a half day Bee-ginner’s Beekeeping course. Held three times a year at the Rutgers EcoComplex in Bordentown, the course introduces students to the basics of starting, maintaining and caring for honey bee colony. The class was originally designed to revive interest in New Jersey’s honey bee industry, and has evidently succeeded; each offering is packed, and seats in the $215 course routinely sell out. The rise of Colony Collapse Disorder in 2006 only further fueled interest among New Jersey residents eager to help this important pollinator. According to State Apiarist Tim Schuler, 21 percent of the 3,073 bee colonies surveyed died in the winter of 2011-2012. The reasons are varied but the biggest culprit is varroa mites. Beekeepers that did nothing to treat the mites saw a 44 percent death rate while those who treated for the mites saw death rates around 17 percent. Another factor: supplemental feedings. For those who saw poor honey flows in the fall, additional feedings helped improve the bees’ ability to survive the winter, Schuler said. When Michael Long took the Rutgers Bee-ginner’s class in the spring of 2007, he didn’t know about all the bees dying off. He just wanted to find a way to help his small backyard orchard of pear and apple trees. He remembered listening to Schuler in class say that some in the audience would become professional beekeepers. New Jersey State Apiarist Tim Schuler works on a hive at one of OCPE’s popular Bee-ginner’s Beekeeping classes. Long now operates Uriah Creek Apiaries and manages about 60 to 70 hives, which produce more than 1,000 pounds of honey a year. He’s taken not only the Bee-ginner’s class from Rutgers, but also the advanced course and one on the business aspects of beekeeping. Belson, meanwhile, finds that bees have even woven themselves into his professional life. The former president of the New Jersey Beekeepers Association is constantly asked by judges in the courtroom how his bees are doing that week. 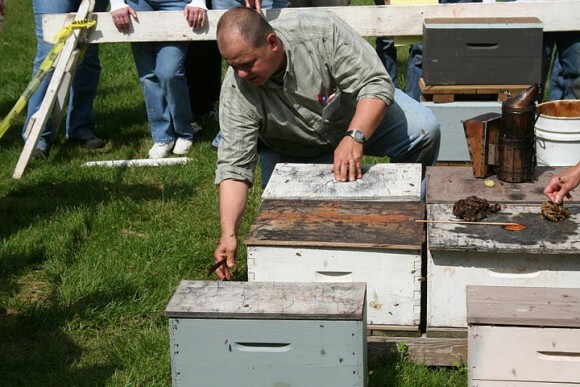 Outside of work, he spends his free time lecturing to elementary schools, community groups and others about beekeeping. Belson shares bits of bee trivia, including that it takes nectar from 2 million flowers and requires 55 miles of flying for bees to make one pound of honey. “Beekeeping has really changed my life for the positive,” he said, noting he’s met many new people and learned many new things since his introduction to beekeeping at Rutgers.